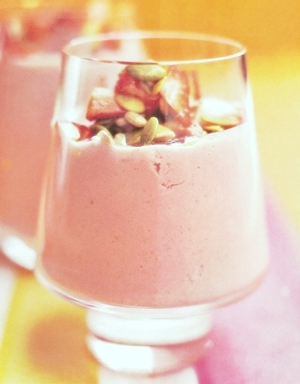 Of course, there are lots of recipes available on how to make strawberry smoothies. I wanted to share with one of my favourites that is perfect for making in your smoothie maker on a lazy weekend morning. It is an energizing blend that is just bursting with goodness for a late breakfast. There are many different views on how to make strawberry smoothies, I love this recipe in particular because it is a little bit unusual in that it includes tofu which is a mineral-rich source of protein with many health benefits. These delicious healthy breakfast smoothies are made from a creamy recipe, blended with seeds for slow release of energy that should keep you going until lunchtime and if you make too much, don’t worry, it will keep safely in the refrigerator until the following morning, provided it is covered. Juice of 1 medium sized lemon. How To Make Strawberry Smoothies. Chop the tofu, hull and chop the strawberries, reserving a few strawberry pieces for decoration of the made smoothies. Place all the ingredients together in the smoothie maker, blending until completely smooth. Pour the smoothie mixture into your serving glasses and decorate with a few extra seeds and the reserved strawberries pieces. You can make these healthy breakfast smoothies with almost any fruit instead of strawberries. Good choices are mangoes, peaches or raspberries. If you have a favourite smoothie recipe, why not send it to us for inclusion on the site? If you have a website of your own, we will place a link to your site with the recipe if we included it.